LOW Taek Jho, or Jho Low, started doing deals in Malaysia in 2006 but hit the big time after Datuk Seri Najib Razak became prime minister in April 2009. He became close to the family through Riza Aziz, the son of Datin Seri Rosmah Mansor from her first marriage. Within five months, 1 Malaysia Development Bhd (1MDB) was born. But even while he was busy with 1MDB’s multibillion-ringgit transactions between 2009 and 2013, he continued with his own private dealings as well as being actively involved in the general election of 2013. To help him, Jho Low put together a team of young people, mostly around his age and quite a few from his home state of Penang. They were put in different companies and some also switched between 1MDB companies and his private outfits. He also cultivated people in public relations and media to try and get them to put a positive spin on him and his dealings. 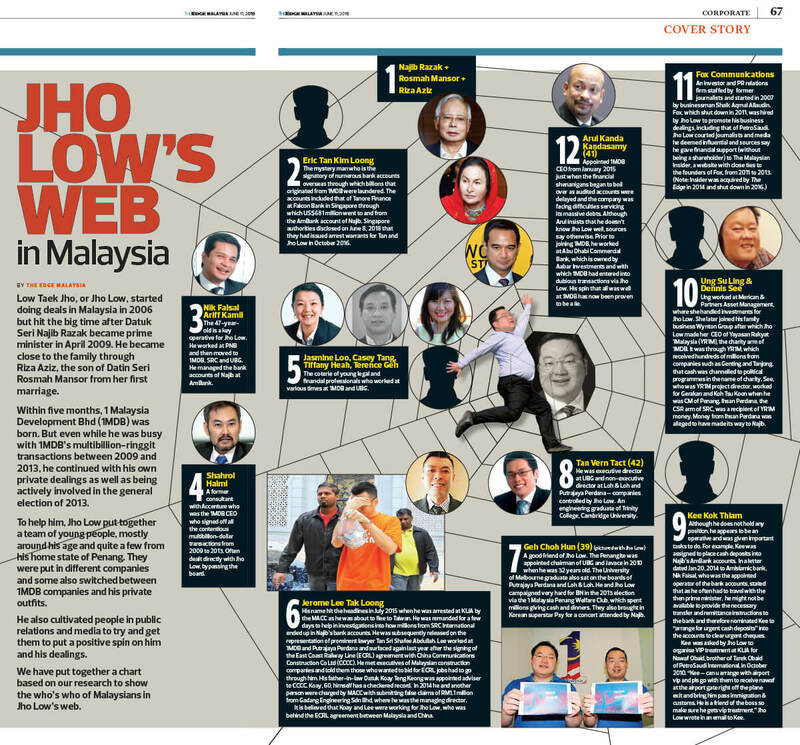 We have put together a chart based on our research to show the who’s who of Malaysians in Jho Low’s web. The mystery man who is the signatory of numerous bank accounts overseas through which billions that originated from 1MDB were laundered. The accounts included that of Tanore Finance at Falcon Bank in Singapore through which US$681 million went to and from the AmBank account of Najib. Singapore authorities disclosed on June 8, 2018 that they had issued arrest warrants for Tan and Jho Low in October 2016. The 47-year-old is a key operative for Jho Low. He worked at PNB and then moved to 1MDB, SRC and UBG. He managed the bank accounts of Najib at AmBank. A former consultant with Accenture who was the 1MDB CEO who signed off all the contentious multibillion-dollar transactions from 2009 to 2013. Often dealt directly with Jho Low, bypassing the board. The coterie of young legal and financial professionals who worked at various times at 1MDB and UBG. His name hit the headlines in July 2015 when he was arrested at KLIA by the MACC as he was about to flee to Taiwan. He was remanded for a few days to help in investigations into how millions from SRC International ended up in Najib’s bank accounts. He was subsequently released on the representation of prominent lawyer Tan Sri Shafee Abdullah. Lee worked at 1MDB and Putrajaya Perdana and surfaced again last year after the signing of the East Coast Railway Line (ECRL) agreement with China Communications Construction Co Ltd (CCCC). He met executives of Malaysian construction companies and told them those who wanted to bid for ECRL jobs had to go through him. His father-in-law Datuk Koay Teng Keong was appointed adviser to CCCC. Koay, 60, himself has a checkered record. In 2014 he and another person were charged by MACC with submitting false claims of RM1.1 million from Gadang Engineering Sdn Bhd, where he was the managing director. It is believed that Koay and Lee were working for Jho Low, who was behind the ECRL agreement between Malaysia and China. A good friend of Jho Low. The Penangite was appointed chairman of UBG and Javace in 2010 when he was 32 years old. The University of Melbourne graduate also sat on the boards of Putrajaya Perdana and Loh & Loh. He and Jho Low campaigned very hard for BN in the 2013 election via the 1 Malaysia Penang Welfare Club, which spent millions giving cash and dinners. They also brought in Korean superstar Psy for a concert attended by Najib. He was executive director at UBG and non-executive director at Loh & Loh and Putrajaya Perdana – companies controlled by Jho Low. An engineering graduate of Trinity College, Cambridge University. Although he does not hold any position, he appears to be an operative and was given important tasks to do. For example, Kee was assigned to place cash deposits into Najib’s AmBank accounts. In a letter dated Jan 20, 2014 to AmIslamic bank, Nik Faisal, who was the appointed operator of the bank accounts, stated that as he often had to travel with the then prime minister, he might not be available to provide the necessary transfer and remittance instructions to the bank and therefore nominated Kee to “arrange for urgent cash deposits” into the accounts to clear urgent cheques. Kee was asked by Jho Low to organise VIP treatment at KLIA for Nawaf Obaid, brother of Tarek Obaid of PetroSaudi International, in October 2010. “Kee – can u arrange with airport vip and pls go with them to receive nawaf at the airport gate right off the plane exit and bring him pass immigration & customs. He is a friend of the boss so make sure he gets vip treatment,” Jho Low wrote in an email to Kee. Ung worked at Merican & Partners Asset Management, where she handled investments for Jho Low. She later joined his family business Wynton Group after which Jho Low made her CEO of Yayasan Rakyat 1Malaysia (YR1M), the charity arm of 1MDB. It was through YR1M, which received hundreds of millions from companies such as Genting and Tanjong, that cash was channelled to political programmes in the name of charity. See, who was YR1M project director, worked for Gerakan and Koh Tsu Koon when he was CM of Penang. Ihsan Perdana, the CSR arm of SRC, was a recipient of YR1M money. Money from Ihsan Perdana was alleged to have made its way to Najib. Appointed 1MDB CEO from January 2015 just when the financial shenanigans began to boil over as audited accounts were delayed and the company was facing difficulties servicing its massive debts. Although Arul insists that he doesn’t know Jho Low well, sources say otherwise. Prior to joining 1MDB, he worked at Abu Dhabi Commercial Bank, which is owned by Aabar Investments and with which 1MDB had entered into dubious transactions via Jho Low. His spin that all was well at 1MDB has now been proven to be a lie.